Although I distanced myself from reflection and prognostication in yesterday’s post, “Back and Forth,” I wasn’t entirely true to my word. Blogging, which is almost always conducted without a watchful editorial eye, has a way of lettings things slip in. 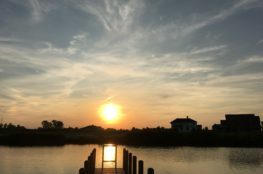 Even so, when I look back at this year’s postings (which means the posts made after the re-launch of Opus Publicum in July), I am generally pleased that each one had a point, though some were a bit sharper than others. “Whimsical” or “stream-of-consciousness” posting rarely appeals to me anymore. There was a time when I felt differently. When I look back at the fragments of my earlier blogging efforts, archived either on my laptop or in excerpts on other web-logs, I can’t help but cringe at the immature way I handled several topics, and the self-assured manner in which I made a stand for this-or-that position which, upon further reflection spurred by critical assault, proved quite rickety. What can I say? It was a learning process. In my early-to-mid 20s I would eat up anything that struck me as iconoclastic, though what passes for “iconoclasm” shifts with one’s environment. If you want to rattle cages in a Left-leaning law school, you don’t do so with appeals to Marx, Nietzsche, and Zizek; you pull instead from the Schmitt, Strauss, and Voegelin grab bag. Not that I didn’t consider myself intellectually aligned to some extent with those three; but a small piece of me will always wonder whether I would have invested so many hours reading and thinking about them if I hadn’t been motivated by a slightly amplified desire to disturb certain classroom conversations. I mellowed out considerably in my late 20s. Having a wife and children will do that to you, as well as being expected to redirect one’s mental energies toward “productive ends.” For me it ended up being aviation and trade regulation, which today seem like the last topics I should have cared about. And maybe I didn’t care about them as much as I cared about learning enough to say something new (or fairly new) and interesting (to half-a-dozen people) about them. Researching both topics produced some genuinely positive spillover effects. For instance, I was forced to learn about a number of legal fields I had only loosely studied in school and then mostly forgot (antitrust, contracts, torts) while gaining a bounty of knowledge from non-legal disciplines such as economics and international relations theory. Sure, I made some bad intellectual bets along the way, but I was disabused of them quickly enough to where I don’t seem to be suffering from any permanent damage. As I sometimes tell people, returning to Catholicism saved me from full-throated libertarianism. Owen White incessantly blasting me for it didn’t hurt either. Here in my 30s I wrestle with being convinced more now than ever about the truth of things, including the direction the heart and mind must go to live in the truth, and the almost pathological fear of calcifying into an ideologue. The near-dormant “Voegelian” in me still whispers that there is a way past ideology; the far more prevalent cynical realist dwelling on the surface of my thoughts and words often assumes otherwise. This tension forces me to return to what I know to be true and then work out from there. And so if it seems to you, dear readers, that I am, or have long been, something of a broken record when I write about Catholic Social Teaching (CST), the social Kingship of Christ, and the crisis in the Church today, it is because I am driven in no small part by the desire to have clarity on these matters before proceeding ahead. Granted, I am not stuck in the mud, but I find it necessary to regularly, perhaps even excessively, turn around and resurvey the way I have come. I know that I am not the only one who does that. I suspect many of us do not do it enough. Speaking of turning around, I want to close this post with a quote that weighed heavily on my mind a decade or so ago when I first encountered it. I recall, with some haziness, a contest staged by the aforementioned Owen White in which his readers were asked to submit a passage that was meaningful or important to them. To be frank, I do not remember exactly why I offered this one, taken as it is from the pages of an early essay by Carl Schmitt which, to the best of my knowledge, has never been translated fully into English. Like everything that has a bad conscience, this age reveled in discussing its problematic character until the twinges of conscience ceased and it could feel better since such reasoning was at least interesting. This age has characterized itself as the capitalistic, mechanistic, relativistic age, as the age of transport, of technology, of organization. Indeed, ‘business’ does seem to be its trademark, business as the superbly functioning means over the end, business which annihilates the individual such that everything must go smoothly and without any needless friction. The achievement of vast, material wealth, which arose from the general preoccupation with means and calculation, was strange. Men have become poor devils; ‘they know everything and believe nothing.’ They are interested in everything and are enthusiastic about nothing. They understand everything; their scholars register in history, in nature, in men’s own souls. They are judges of character, psychologists, and sociologists, and in the end they write a sociology of sociology. Wherever something does not go completely smoothly, an astute and deft analysis or a purposive organization is able to remedy the incommodity. Even the poor of this age, the wretched multitude, which is nothing but ‘a shadow that hobbles off to work,’ millions who yearn for freedom, prove themselves to be children of this spirit, which reduces everything to a formula of its consciousness and admits of no mysteries and no exuberance of the soul. They wanted a heaven on earth, heaven as the result of trade and industry, a heaven that is really supposed to be here on earth, in Berlin, Paris, or New York, a heaven with swimming facilities, automobiles, and club chairs, a heaven in which the holy book would be the timetable. They did not want a God of love and grace; they had ‘made’ so much that was astonishing; why should they not ‘make’ the tower of an earthly heaven? After all, the most important and last things had already been secularized. Right had become might; loyalty, calculability; truth, generally acknowledged correctness; beauty, good taste; Christianity, a pacifist organization. A general substitution and forgery of values dominated their souls. A sublimely differentiated usefulness and harmfulness took the place of the distinction between good and evil. The confounding was horrific. Add “Bejing” to the litany of cities and swap-out “club chairs” for “iPhones” and this description of late modernity, first penned nearly a century ago, still holds true today. I disagree with none of it.